This week will see the middle chapter in writer Dan Jurgens's brief run on Green Lanterns, in which Simon Baz finds himself accused of murder after his ring is compromised -- and in this week's issue, the characters start their big face-off with Cyborg Superman Hank Henshaw, who is the one responsible for the sabotage. 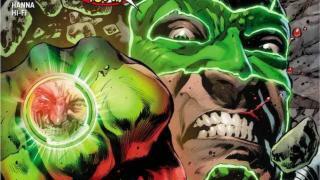 Why did he attack the Green Lantern Corps, and how? Well, that is what the next few weeks' worth of stories are about, culminating in a showdown between Henshaw and Green Lantern Hal Jordan in Coast City -- the two Henshaw destroyed in a 1993 comic written and drawn by Jurgens. Jurgens joined ComicBook.com to discuss his Green Lanterns story, which leads up to Grant Morrison's relaunch of the title this fall. You have obviously been the guy at the end of a long run with new talent coming in before. Are you conscious in a situation like this that you want to make sure you aren't breaking any of Robert Venditti's toys ahead of the new team? I think I would rephrase the question from breaking all the toys to more, am I aware of consistency with the characterization and everything that was already in place? The answer to that would be yes. Both Baz and Jess have their fans out there and I certainly want to be true to those characters. I think that’s important. They are stepping down from being the lead characters in the book right now. Did you look back at their earliest appearances to see whether there was anything you wanted to make sure you touched down on to bookend them? I certainly wanted to be aware of their earlier and earlier appearances as well as how they have progressed. I think it is important to be true to them more the way they are now than the way they were then, because they have changed. The Guardians of the Universe are a bigger part of this arc than I feel like they have been in a while. I think The Guardians are so much a core of the Green Lantern mythos that, yes, I wanted to get them back into the story and involved in a central way. Did you research stories like Emerald Dawn II and The Trial of Arkkis Chummuck to get the feeling of how internal GL Corps "justice" is handled? I didn’t go back and look at them. I remember them from reading them the first time. I think this one is a little bit different because of the level of deceit that was involved on this throughout the Corps, so I wanted to make sure I stayed true to this story and what was responsible for engineering this massive deceit. Do you feel like this notion inherently changes how the Corps members look at the rings and the Guardians going forward? I do. Part of my concept here was to say that these rings are all connected by a single power source. If you start to think of it like computers on the internet and the connectivity that is there, to me once you start to mess with one ring, you kind of start to mess with all of them. I see a level of connection among the Green Lanterns. Hal will be stepping up to be THE Green Lantern again when Grant joins the books, and while so far he has not really taken over your story, he certainly is positioned to do so, facing off against Henshaw in the finale. Is there something about him that's special in a way nobody else can quite touch? I think that is going to be proven out somewhat by the end of the story. I think to a certain extent, and this is a poor comparison perhaps, but it’s sort of like all of the other Lanterns are franchise outlets and Hal is a solo operator. Again, with Hal stepping up and the main characters of Green Lanterns kind of stepping aside, were you cognizant of making sure you did right by their fans? Yeah. As long as it fits the context of the story, yes. I would like to think that we did that. To me, they both have traits that make them very interesting as solo characters, and that’s something you want to play up on. I think exploring this level of trust that exists between the two of them is very much a part of what this story is. The Green Lantern duos are often pitched as an opportunity for "buddy cop" kind of stories, but really it feels like Baz and Jessica are the first time that promise has really been fulfilled. That’s true, and I think that’s what we have here that’s unique. These two have been allowed to have a partnership — but they haven’t known each other that long. I still say that this idea that you’re going to put a ring on your finger and then you’re going to fly over a city at an altitude of 2000 feet and have 100% confidence that it’s not going to konk out on you and drop you into a bloody spatter on the ground? When someone tries to sow the seeds of doubt, just how far will that go, even with a pair like Simon and Jess? I don’t know that it’s one or two Lanterns against the system as much as it is, the system is falling apart. If you can’t believe what you’re told -- and there are obviously some things that resonate with what we see in the real world right now -- what can you believe? I’m fascinated by the concept that these rings can talk to whoever is wearing them and that whoever is wearing them just assumes that the ring is truthful. It’s not distrust of the Guardians, it’s more like the system is corrupted. When that happens, what do we do? How did you come into this story? Was it a DC pitch or did you come up with the idea? Nothing was pitched in terms of them approaching me with the story. When I was first asked to do it, I turned it down. And they said just think about it, so we talked about it a little bit. Sometimes the ideas and thoughts just start percolating and all of a sudden it’s there and you have something. So even though I had said no, I had thought sin the back of my mind, and then there was a story, so I said sure, okay, let’s have some fun with it. I think the undercurrent that goes through all of this is trust and distrust, but it’s all wrapped into this big adventure that I think spans a lot of different things and certainly is hopefully a lot of fun at the same time. I think the reveal of who’s behind all of this in terms of it being Hank Henshaw and all of these things makes him a logical foe. The grand adventure of it all makes it fun. Do you have to be really aware of what else is going on in the DCU right now, with so much cosmic stuff happening in Justice League and the like? Certainly. Very early on, Scott and I talked about the idea of who is John, what is he? To me I have always thought John by virtue of being an architect should have a different view on how he does things as Green Lantern for example. Whenever you do something you have to be sure you’re not stepping on anyone’s toes. Obviously you sent Henshaw away in Action Comics #999, in what I thought was a really effective story. Did you know right then that you were going to use him again so soon? When I did 999 I had a couple of different ideas floating around in my head as to what would come next or Henshaw. At the point we left him he either get out and becomes a villain again or he gets rehabilitated. I don’t think you necessarily want to rehabilitate the character at this point. So I always think, what’s the next story?